Submitted by Joan Martin's friend Carolyn in Mississippi: "Maya is one very special bird and I love her dearly. I’m glad I didn’t listen to folks who said it couldn’t be done." I fell in love at a poultry show with a peachick. She was so cute I couldn’t resist bringing her home with me. People said you can’t tame a peafowl, but I was determined to give it my best try. I named her Maya. She was only about the size of a bantam chicken when I brought her home, so I put her in a cage with my Serama rooster named Sierra. They bonded right away. Maya didn’t want him out of her sight. As chicks do, she started to grow. And grew and grew. She got so tall Sierra had to look up at her, but they still loved each other. To my delight, she bonded with me also. I think it helped for her to be an only peachick and raised with a rooster. She watched me hold and cuddle Sierra and saw it was OK. So she let me hold her too. Even though she is grown up now, she still lets me hold her on my lap and hug her. We cuddle and put our cheeks together. She has free range of my house. At night she sleeps up high on top of a cage. 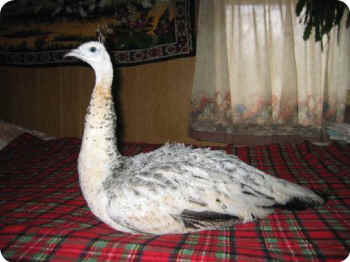 A peahen is an unusual house pet but Maya is a wonderful one. So don’t let anyone tell you that you can’t have a peahen companion. One just might surprise you. Maya is one very special bird and I love her dearly. I’m glad I didn’t listen to folks who said it couldn’t be done.